The PCAN-PC/104 interfaces provides a simple connection between PC/104 format and CAN-networks. PCAN-PC/104s supports both 11 bit ID and 29 bit ID CAN specifications with a maximum speed of 1MBaud they use the SJA1000 CAN-controller and the 82C251 driver. The CAN-bus connection is via a 9-pin SUB-D plug, whose pin assignments conform to the CiA recommendation. No termination is included in the interfaces. 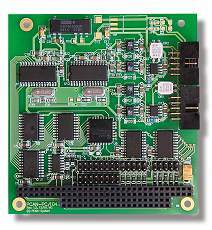 The PC/104 to CAN converters are ideal for use with embedded applications. Dual channel opto isolated versions are available if required. The PCAN-PC/104 Fourteen different I/O-addresses (200h –3A0h) and eight different IRQ-maps (3, 4, 5, 7, 10, 11, 12 and 15) are jumper selectable. It is also possible to work with more than one module in a PC/104 computer simultaneously sharing interrupts. 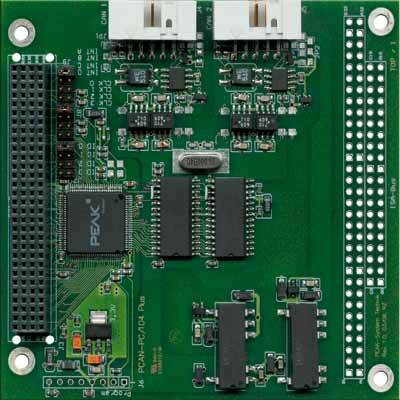 The PCAN PCI/104-Express card allows up to 3 cards to be stacked into a PC104 Express configuration. Are a set of drives for time critical multi-threaded applications and the PCAN-Explorer package that provides advanced CAN bus diagnostics, reporting and control capabilities. Explorer supports J1939 and there is a PCAN-FMS package to operate with that standard.